Kastar retaining ring pliers tip kit contains durable alloy, color-coded interchangeable tips and hex key for use with part# 1434, 1435, 1445, and 1446 Kastar quick switch pliers. The 1447 Kastar Retaining Ring Pliers Tip Kits is one of thousands of quality tooling products available from MRO Tools. 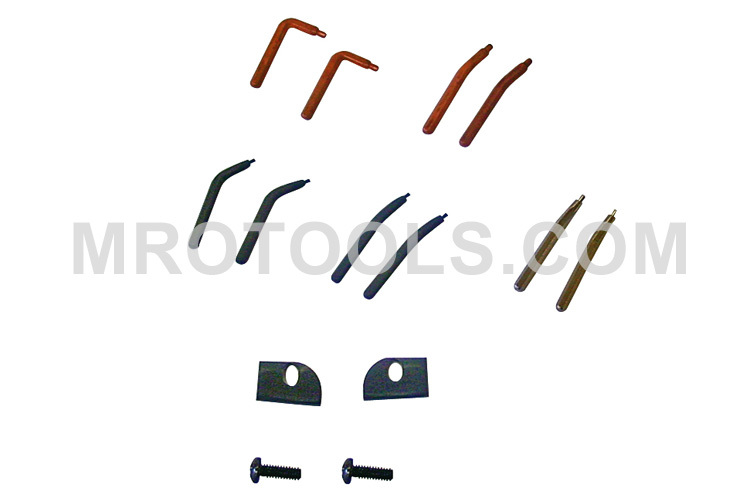 Please browse Kastar Retaining Ring Pliers Tip Kits for tools similar to the 1447 Kastar Retaining Ring Pliers Tip Kits. 1447 Kastar Retaining Ring Pliers Tip Kits description summary: Kastar Retaining Pliers Tip Kits. Tip Sizes: 0.039'', 0.047'', 0.074'' (1.0mm, 1.2mm, 1.9mm) Tip Angles: Bent 15°, Bent 45°, Bent 90° Quantity discounts may be available for the 1447 Kastar Retaining Ring Pliers Tip Kits. Please contact MRO Tools for details.